Some of our jobs just have it. Good craftsmanship, effective design and the ability to bring out the best of your house. That's the case for this job; a terracotta tile, hip roofed carport in Sherwood, western Brisbane. Martyn Hewett, owner of the Kenmore branch of Outside Concepts certainly did his homework on this job. This job didn't cost an arm and a leg but there's a handful of design features which really make it sing. Apart from providing generous shade and protection for two cars, the roof pitch, slope and matching tiles ensures it blends seamlessly with the house. The simple fence screening provides a safe and secure separation of yard from cars – great if you have small children or pets. But what's even better is that the way the screening replicates the low, open mesh of surrounding boundary fences so that it blends and embraces its new setting while enhancing the streetscape and playing nicely with the neighbours. Wow! 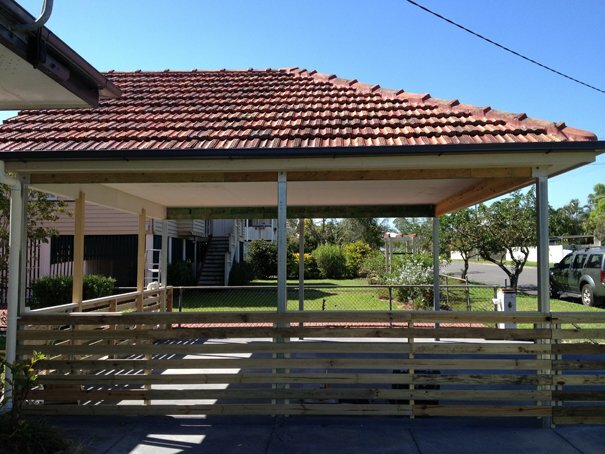 "We're very pleased with the carport, it's better than I'd envisioned. Thanks for the hard work. I'm sure we'll contact you again for other projects in the future."